It’s bonfire night tomorrow! And the festivities will likely continue all weekend long. Everybody loves bonfire night. It’s the most loved (and probably the only) celebration of a foiled assassination plot in the world. But bonfire night is only fun if it’s enjoyed safely. You have to remember to take the proper precautions before throwing a bonfire night party for friends and family. We’ve put together a few tips for a safe bonfire night. Many of them include plastic buckets as a simple but effective safety feature. Fireworks are the most dangerous aspect of modern day bonfire night. 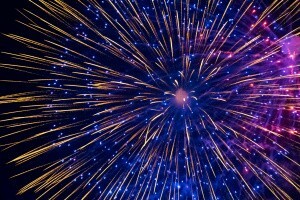 Used to symbolise the gunpowder used by Fawkes and his conspirators, fireworks can pack a powerful punch. And they seem to get bigger every year. You should always buy fireworks which meet the British Standards (BS 7114; 1988). Don’t be tempted by dodgy retailers. Preparation is crucial to a safe firework display. Make sure you have eye protection and some sort of padding for your head and gloves. You should also have a bucket of water (or a few buckets of water) nearby to douse any fireworks which don’t seem to go off after 30 minutes. You should also have safe launching equipment. Lots of firework sets will come with a small plastic tube which you’re supposed to put into the ground and fire from. But take it from me – these small tubes can fall over – and the results are pretty scary. Best practice when you’re launching fireworks suggests that you should fill a large bucket with earth or sand and insert the tube into this before firing. Sparklers can be very pretty, and it’s a good way for children to get involved in the fun of bonfire night. But they can also be dangerous. Sparklers can reach temperatures of up to 2,000°C so make sure your kids are wearing gloves. Children should be supervised at all times and children under five should be kept away at all costs. Sparklers stay hot for a long time after they’ve burned out – and curious fingers can get burned easily. That’s why it’s a good idea to have a bucket of water or sand nearby to dispose of any sparklers in. The fire service recommends that you keep a few buckets of water and sand nearby if you’re hosting a bonfire party. Although these measures might sound overly cautious – they would be welcomed if there was an accident and something or someone caught on fire. You can buy buckets cheaply and in bulk from bucket manufacturer and seller H&O Plastics. Shop online now.